The Venezuelan government says it has arrested nine Colombian right-wing paramilitaries who were plotting to assassinate President Nicolas Maduro. Interior Minister Miguel Rodriguez said the nine had been instructed to go to the Venezuelan capital, Caracas, and carry out the plot. More arrests are expected, he added. President Maduro was elected in April to succeed late president Hugo Chavez, who died of cancer after 14 years in office. In May, Mr Maduro accused Colombian politicians, led by former President Alvaro Uribe, of plotting to kill him. "Uribe is a killer," he said at the time, adding that the "Venezuelan right" was also involved. Mr Uribe, a critic of Hugo Chavez, dismissed the accusations and said he would take President Maduro to the Inter-American Commission for Human Rights over the statement. In his latest accusations, the Venezuelan president did not mention Mr Uribe. Mr Maduro on Sunday posted a message on Twitter saying his government faced "a plot the fascist right supported by violent groups in Colombia". On Monday the Venezuelan interior minister announced the arrests of two groups of Colombians took place at the weekend. The first group, with alleged links to the Rastrojos paramilitary organisation, was arrested in western Tachira state, Mr Rodriguez said. The six people arrested were named as Elisa Cruz, Pedro Araujo, Arlington Miranda, Jose Israel Echavez, Javier Rodriguez and Giovani Sala. Another three men - Luis Enrique Gomes Lopez, Jose Guerrero Angulo and Manuel Guillermo Munoz Espino - were arrested in Portuguesa state, also in western Venezuela. Mr Rodriguez said they were under the command of Colombian paramilitary leader Jose Maria Barrera, better known as Chepe Barrera. "There are links between the first and the second group, as both had been told to travel to Caracas to accomplish their mission," said Mr Rodriguez. 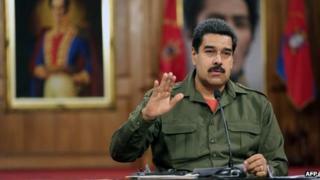 Weapons, ammunition and fake uniforms of the Venezuelan army were seized from the alleged plotters, he told journalists. The Venezuelan government says a third group of Colombians, which is also part of the plot, has probably managed to get to Caracas. "They are being tracked down by our intelligence services," said Mr Rodriguez.